Does Disney ever run out of magic? 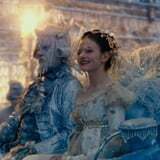 Judging from our exclusive clip from their upcoming film, The Nutcracker and the Four Realms, the answer is an emphatic no. The film, which hits theaters on Nov. 2, is a beautiful look at the magical world young Clara (Twilight's Mackenzie Foy) finds herself in, which includes a dashing soldier (Jayden Fowora-Knight), a gang of mice, the Sugar Plum Fairy (Keira Knightley), and a tyrannical Mother Ginger (Helen Mirren). In the footage, the cast breaks down each of the dazzling realms that Clara encounters while trying to locate a strange and mysterious key that can restore harmony in this parallel world. POPSUGAR and Disney, in partnership with Glade, will celebrate the new release of The Nutcracker and the Four Realms with an immersive activation, Journey Into The Four Realms, on Oct. 21, 22, and 23 at The Oculus at Westfield World Trade Center in New York City. Open to the public for three days, this maze-like adventure will immerse you in the Land of Snowflakes, Land of Flowers, Land of Sweets, and the mysterious Fourth Realm. The eye-catching activation will be photo-ready and infused with Glade scents at every turn, and before exiting the experience, guests can enjoy manicures provided by OPI and take home a complimentary Glade Scent inspired by the film. Find out more details ahead!